New York Fashion Week may be over but its still living in my heart and My Pictures folder. Neutrals were expected to be a big part of the Fall '09 collections, but the rich, bright colors and construction caught me off guard. Its nice to see the runways re-enforce a commonly unknown style tip: Color doesn't have to fade from your closet just because Autumn comes around. Designers like Marc Jacobs, Thakoon, and Jason Wu put this rule in action with splashes of bold hues and interesting color combinations. 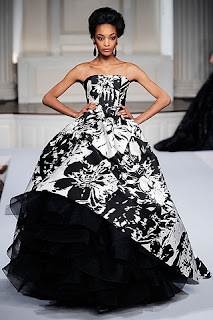 As per usual, Oscar de la Renta outdid the rest at using color, creating fabulous silhouettes, and impeccable fit. Take a peek at a few more colorful looks from the collections. these are incredible picks! I love them all but my absolute favorite is that first fuchsia oscar dress....gorgeous!!! i say every year i will go..
You are right...these are great. Love the purple Oscar de la Renta dress! Oscar De La Renta RUNS THIS DRESS MAKING STUFF!! !